The word worm in v. 14 pictures man in his unclean, sinful state, in contrast with God, the Holy One of Israel. The particular Hebrew word refers to the worm from which crimson dye was made; crimson being a word that is often used to denote sin (Isaiah 1:18). In vv. 15-16, Israel is depicted as the Lord’s instrument in bringing their enemies to nothing. Israel will be a sharp, new threshing roller with two-edged knives, like an instrument that cut up the straw for fodder, and separates the grain from the chaff. The mountains and hills, figurative of proud and powerful enemies, will be threshed to powder, and scattered and destroyed, as chaff is blown by the wind. Of special interest is God’s description of Himself as the Holy One of Israel, and as their Redeemer. These two promises are repeated often in the book of Isaiah, emphasizing that God intends to keep all His promises to His people. I’m surrounded by gadgets, and I never thought I would be. It started with a clunky computer that was rescued from the the computer cemetery. I needed a computer when I started working on my master’s degree 21 years ago. There were going to be so many papers, so much research. The research would mean hours at the school library, miles and miles on the car, unless I got connected to the internet. Now, years later, I have a MacBookAir that I use at work, usually bringing it home each evening to make sure no one gets into it when I’m not in the office. I have an Android cell. My first cell phone was a flip phone. We got it so I could call Terry if I got into trouble on the road, especially late at night. That’s back when I was working in Montgomeryville until 9 p.m, a good half hour from home, as well as in Coopersburg until 9 on Tuesday. Terry really didn’t like my being on the road late like that. And I have a nice, new desktop that so much fun compared to my old one. Terry, surprisingly, spends a lot of time using it to research all sorts of equipment for his various projects. We have a smart TV. We never had TV when our own kids were home, a decision we made to eliminate at least one area of potential problems. They all have TV now, but they tell me they rarely watch. That’s good. I have an electric toothbrush and flosser; a cool little electric shaver to take care of my moustache and whiskers–stop laughing, it’s not funny! I have an electric doodad that I use to flush out my sinuses every day so I don’t have to use so much nasal medication. I have an Alexa, over which I play lots of music, set timers, ask about the weather, and a bunch of other things. I am SO connected! I didn’t even mention our CD player, which doesn’t get as much use these days as it used to. There are other items around the house that work on electricity–my coffee grinder, the microwave, all the other appliances. Plugged in, turned off or on as needed, dependable, labor-saving; things that connect me all around the world. I even have a Kindle, which I could use to read the Bible. But I don’t. I just don’t like to read the Bible that way. I love my print Bible, which I can write in, underline–I know, you can do that on Kindle, too, but I just don’t want to. There’s something solid and reassuring about my Bible. I want it in my hands, not on an electronic gadget. And it keeps me connected, too. It keeps me connected to my Lord. There is nothing more important than that. Thanks to many, many years of reading and memorizing God’s Word, I have it in my head and my heart even when the electricity goes off and the electronics die. It will always stand, no matter who decides to try to ban it. God’s Word is truth; its truth is eternal. 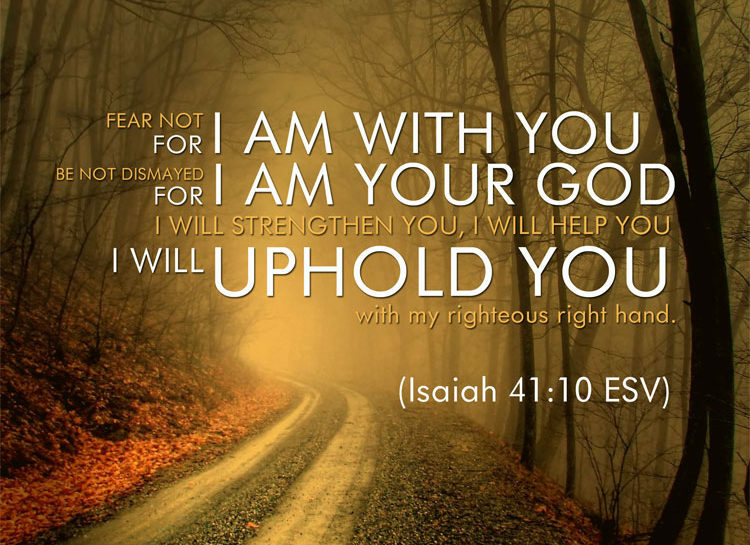 Switching now to far future prophecy, God reassures Israel that there will come a time when no one will be able to stand against them because HE, the great I AM, will protect them and will hold their right hand. We have to keep in mind that Satan is the biggest enemy Israel has, and through the centuries his rage against Israel has caused them endless grief. When Israel moves away from God, worships idols, becomes pagan in their style of living, God removes that right hand of strength and help. But when Jesus Christ establishes His kingdom on earth, centered in Jerusalem, no one will be able to contend with Israel. No weapon will succeed against them. 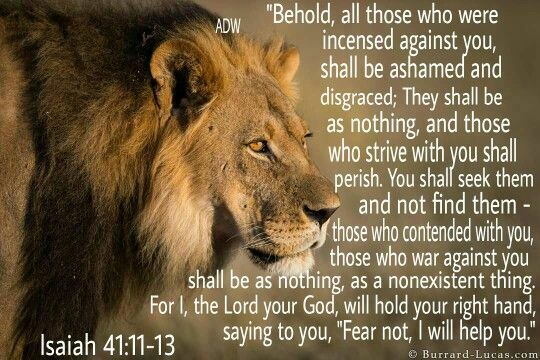 Those who have hated Israel will be ashamed, confounded; with all their power and armies and weapons, they shall be as nothing; they shall perish. In these present times, when most of the world has turned against Israel, America needs to continue to stand as Israel’s friend. It is for our present and future benefit to do so. There will come a time, I’m sure, when the political powers of our nation will join all the nations in condemnation of Israel. When that happens, American’s days of being relatively free from persecution will come to an end. I have loved this verse for years. Precious promises of God that I have seen at work over and over in my lifetime. As I age and my body begins a slow process of breaking down (degenerative joint disease, stenosis, herniated discs) I rely more and more on that righteous right hand of God to get me through each day. He never promises us that life will be pain-free, trouble-free, comfortable all the time. He does promise that He will always be with us through every trial. God always keeps His promises. Always. Following His description of the Gentiles trying to seek their gods to defend and protect them against Cyrus, God turns His attention to His people, Israel. He tells them again that they are His chosen ones, descended from His friend, Abraham. I have pondered many times on God’s use of the word friend as God applied it to Abraham. The Hebrew word, ahab, denotes having a strong affection for, or love for, someone else. To be a friend of God is to have strong affection for Him, to love Him especially compared to any other relationship one may have. Many times, Israel has been blessed as a nation because of their relationship with such men; men who loved God above all others. Abraham and David have both been especially named by God as friend and man after God’s own heart. Not only has Israel been blessed for the sake of such men, but indeed the whole world. It was from the line of David that Jesus Christ was born. He was the instrument of our salvation, available to Jew and Gentile alike. It is no light thing to be named as the friend of God. These verses picture the various countries fearing Cyrus and uniting against him. The isles (maritime countries) and the far off parts of Egypt, Palestine, and Asia Minor saw this coming struggle and, in fear, they came together in a federation to fight Cyrus. In verse 6, they encouraged each other not to be afraid of the invasion of Cyrus. The encouragement here was to make new images for the temples and thus obtain the favor of the gods whom the people trusted to rescue them from Cyrus; so they fashioned idols and set them in their places that they should not be moved. This is another instance of sinners seeking to avert judgment by becoming religious. Such turning of pagans to idols to avert destruction only shows the futility of such trust. I am reminded of how American churches filled up for a couple of weeks following the Islamic terror attacks on 9/11. Until the peak of the terror passed, people were suddenly turning to prayer, to religion, to a form of worship. It didn’t last very long. Things settled back into their normal routine, and God was tucked back into His corner until some other tragedy should happen. I don’t think I had heard God Bless America sung so often, other than in WWII movies, in all my life. The truth is, God is not some idol to be called upon only in times of danger. If we don’t worship Him in spirit and in truth, we have no right to expect Him to bail us out of trouble and then go back into the corners of our lives when the danger has passed. 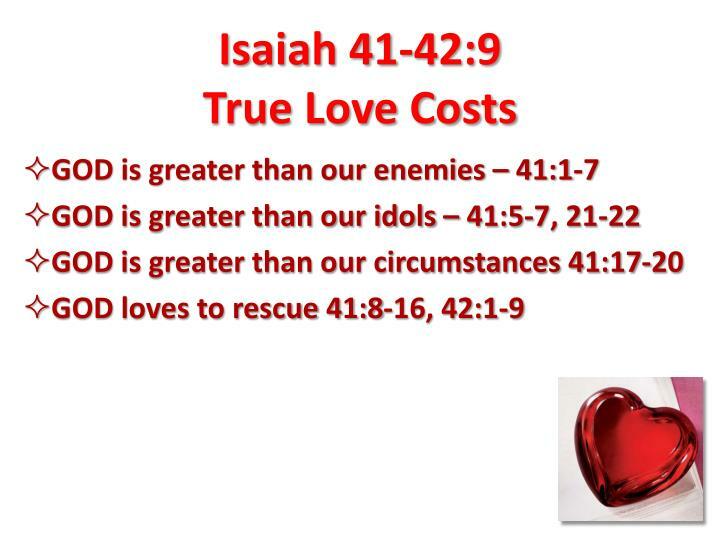 This verse claims the omniscient–all knowing–God. He was First, His is Last. 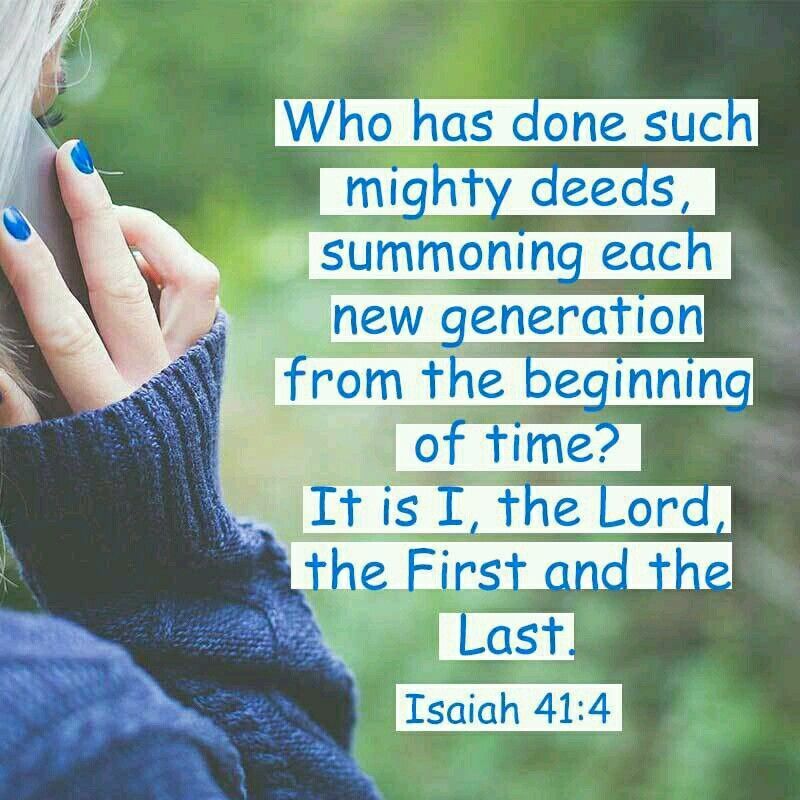 He has called each generation from the beginning of the existence of mankind on the earth. Jehovah is the Aleph-Tau and the Alpha-Omega of the Bible–the first and the last; from eternity to eternity, the Self-existent, and the Eternal (44:6; 48:12; Rev. 1:11, 17; 2:8; 22:12). The Word of God is consistent from the beginning to the end in many references to God calling Himself I AM. This is not an easy concept for us. It’s meaning is that He has always existed, and always will. He has no beginning, no ending. He is the beginning and the end of all that He created. His knowledge so far surpasses ours that they simply cannot be compared. We would save ourselves a lot of frustration if we would simply realize that we can never understand God in this life, but that He completely understands us.